The chamfer is designed to produce compound angled parts. This operation is accomplished using two chamfer wheels with angles according to the user specifications. The wheels are adjustable +/- 5 degrees from perpendicular (Note: the +/- 5 degrees could be adjustable more or less depending on the size of the part and the shape of the fixture). The Slotter in this machine is setup from the factory to center slot brake pads. 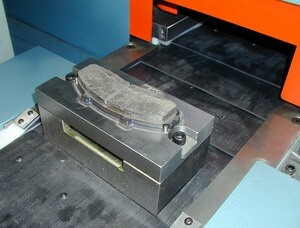 The machine is designed to perform a maximum of 3 slots per brake pad. Slot depth is adjustable depending on the customer’s specifications. The grinder is setup to surface grind the brake pad. This machine utilizes a diamond-grinding wheel. Any of the three functions may be performed independently of the other operations. The parts are conveyor fed into the machine. An operator must place the parts on the conveyor in a correct orientation. The parts exit the machine one at a time in an orderly fashion. The chain conveyor speed is adjustable for finer cuts or greater production speeds.